While I'm having some difficulties with MD2019's new lack of support for keyboard navigation in the 'Import' dialog box (see discussion http://help.infinitekind.com/discussions/problems/50445-2019-1847-import-qif-restricted-keyboard-navigation) MD2019 is still happily allowing me to periodically (I do it every few weeks) import QIF files to each account. Unfortunately, every import mysteriously creates an extraneous 'Imported Bank Account'. Transactions from the QIF are correctly loaded to the target account, but an extra (empty) account is created (see screenshot below). If I import a series of QIFs to multiple accounts during the same session, only one 'Imported Bank Account' is created. Thus, following any QIF data import, I need to dive in to Tools->Accounts and delete the extraneous account. I have confirmed that this behaviour can be reliably replicated - I've just tested, using four different accounts from three different banks. I presume this behaviour is NOT as intended! (and it certainly wasn't evident in MD versions prior to MD2019). And, I can no longer navigate the import dialog box using just keyboard navigation. We've gone backwards in terms of both functionality and usability, when it wasn't, as far as I could see, actually broken! I can only suggest if you are not getting support and the product is not working as it should you do what people should do whenever they are dissatisfied and that is complain to the management. Just discovered MD for Mac only does this if I use the auto open option for .qif files. Manually importing does not create the Imported Bank Account. Have been manually importing .qif files on PC so perhaps that’s why I never saw it. All the tests I have done I have manually imported QIF files (on Windows 10), all except one imported without problems one however created the Imported Bank Account and I was able to get it to do it twice in two different data sets. I can see nothing in the QIF file that explains why. I continue to see the issue, absolutely repeatably, if I use ‘File->Import’, or if I double-click a downloaded QIF file in the Finder. In all cases, the erroneous empty ‘Imported bank account’ is spontaneously created during the data import. Yes it’s a total pain and a rubbish response. I cannot say I blame you, QIF imports worked perfectly in previous versions the only issues were people choosing the wrong import parameters, but that is pretty easy to spot and fix. I have posted pointers to this thread on the developers web site but have seen no acknowledgement at all. Just downloaded and tested build 1859. While the 'import to' dialog drop-down menu has been reverted to a style that allows keyboard navigation, importing a freshly downloaded QIF of transactions still spontaneously creates an erroneous, empty, 'Imported Bank Account'. At least there is some progress. I've been able to reproduce the problem on a new data set using a specific QIF file. I have provided a pointer to the developer on the file that I can get this problem with. The latest preview has a note about correcting the erroneous account being created.. I however am still getting the extra account created with the test QIF I am using but of course you may get different results. build 1860 no longer created the extra account, the mapping popup defaults to 'Imported Credit Card Account'. After selecting the appropriate account, the file imports correctly and no extra account was created. The only difficulty that I experienced, was that the mapping wasn't saved (as in the past). Even after closing and reopening app and re-importing, it will default to the mapping screen that begins with 'Imported Credit Card Account' I then have to re-select the appropriate account each time. Not a big deal but still not performing as previous versions. In my case the above is true, but its a bank account not credit card. The default is "Imported Liability Account" and you cant save the choice. More concerning is an import freezes my PC W7. It did this on the previous version, unless I deleted the rogue account. My feeling is there is still this phantom account somewhere in my data, as the chooser box seems to list all the accounts on my file ? When you have to re-select the account in the import window, is the credit card account that you'd like to import to selected and showing its register? Import box shows list of accounts with imported liability at top. The way that I perform the import is to open the credit card register first (In this case Amazon Prime (Synchrony Bank). I then use MS Edge to go to the site. I select the appropriate parameters for exporting data. After I click on 'export', a dialogue box opens, asking whether to open or save. I click on 'open". The MD import window opens to the default 'imported credit card account'. I select the Amazon Prime Account. The import works as expected. I can merge and reconcile without issue. When I go back to the site again (As I just did to outline this submission), the process is exactly the same. The import box defaults to 'Imported Credit Card Account' until I manually select the correct account again. I hope that this additional information is helpful to you. In my case, I do have the ability to select a qfx file instead, so it is not causing a major issue for me (although the qif file provides better transaction description fields). Thanks for your prompt attention and continued efforts for resolution. Hi all (Sean, thank you for joining us!). While build 1860 has cured the spontaneous creation of an empty 'Imported bank account' on QIF import, I can see the import dialog box is offering to import to what is, at that point in the process, a non-existent new account called, unsurprisingly, 'Imported bank account'. If I scroll and click to select the correct account, the data import to the targeted account proceeds normally and no extraneous account is created. I have not been brave enough to attempt importing into the proposed new account! I see the same indications if the QIF originates from a bank savings account, a credit card account, or a loan/liability account, and the account register (if any) open as I commence the import does not vary the result. Summary: in all cases, the import dialog proposes import to a non-existent account called 'Imported bank account'. MacBook Pro, MacOS Mojave 10.14.3. 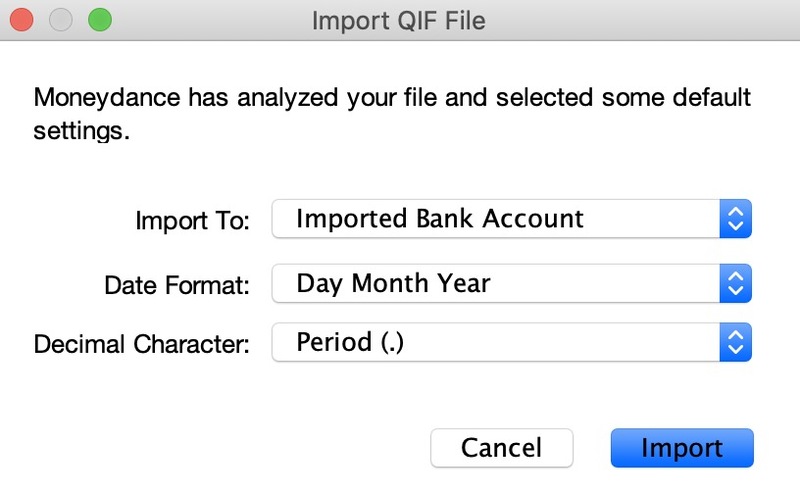 Yes, QIF files for single accounts usually do not specify the type of account that they are associated with, so Moneydance shows the "Imported Bank Account" option to give you the opportunity to put the transactions from the import into a new account with the default type (bank) but the ability to change the account type for the new account, or to simply select a different existing account. In recent builds you can also change the type or currency for any accounts, provided that they don't already have existing transactions in them. I'd love to hear any suggestions or reports of problems with this new setup. Good morning Sean, I’ve just downloaded and tested build 1867b, and tested import of a freshly downloaded QIF. - and, most importantly, the app then freezes. Must force quit. - on subsequent relaunch, imported data is OK, and single-line view is restored. All too late for me, after eight years of using Moneydance, I’ve switched. It’s been great, but these QIF import difficulties over the last few months have been too much for me. Interesting. I had, and still have an issue with it crashing on W10 if I import ( by download and file association) without Moneydance running. I think that’s likely a different issue to the Mac. However here is the interesting bit. When it crashes my W10 I get the double line view. After a force restart it’s back to single line. There must be something common here.